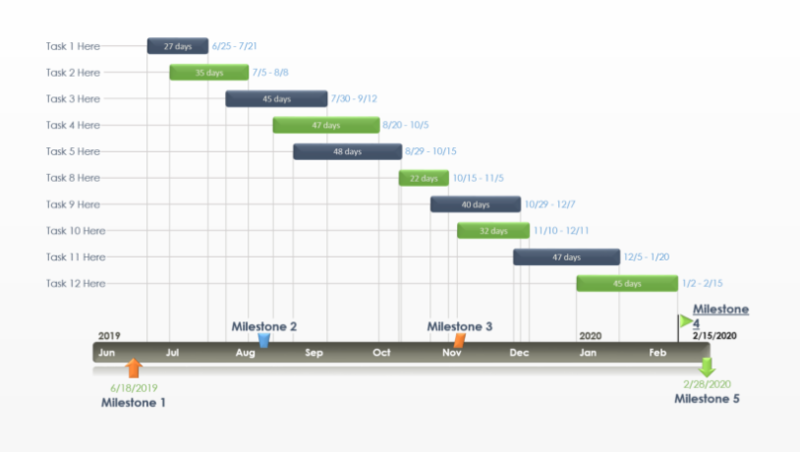 This step-by-step PowerPoint timeline tutorial will show you how to make professional timelines right inside the popular presentation tool. Microsoft PowerPoint enables users to create a basic timeline that they can manually adjust and restyle to fit their needs. 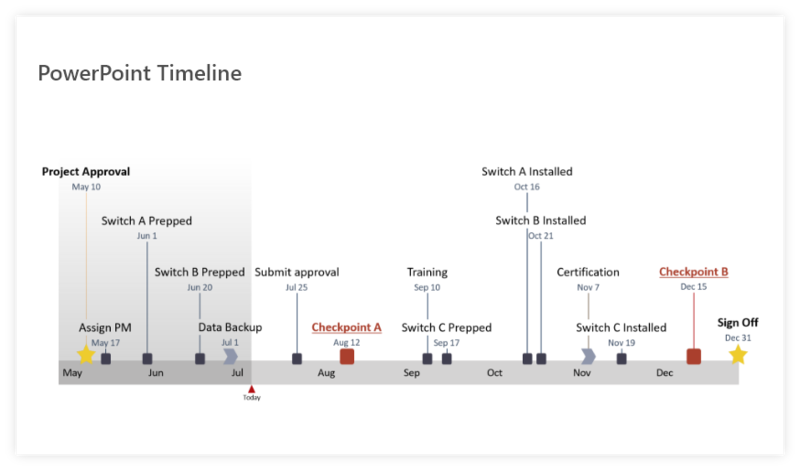 The result is a simple graphic fit for presentations to clients or executives, but not quite flexible enough for those who need to show more accurate details or update the timeline regularly. For those who need to regularly create and update timeline slides for high-level presentations, a simple and fast solution would be to use a PowerPoint add-in that automates the process. 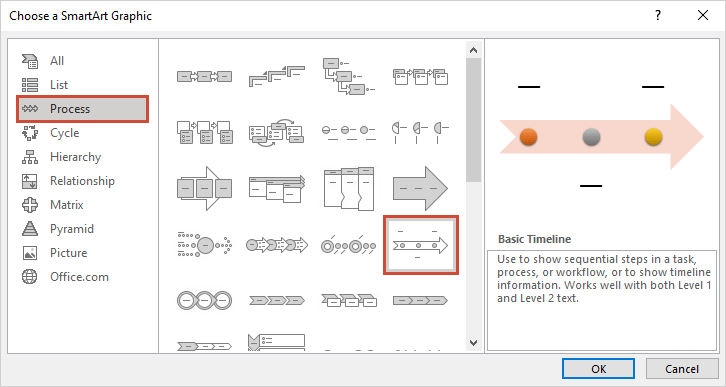 On this page, you will see both the manual and the automatic way to make a timeline in PowerPoint. Create a new presentation or open an existing one and add a new blank slide. 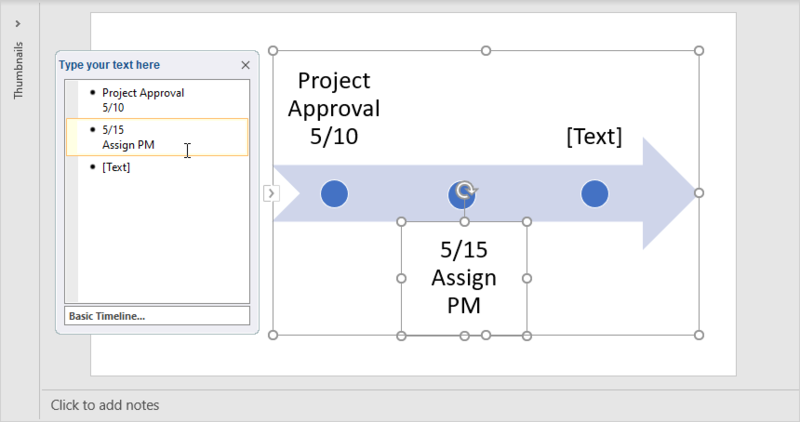 Go to the Insert tab on the PowerPoint ribbon and click on the SmartArt button in the Illustrations section. 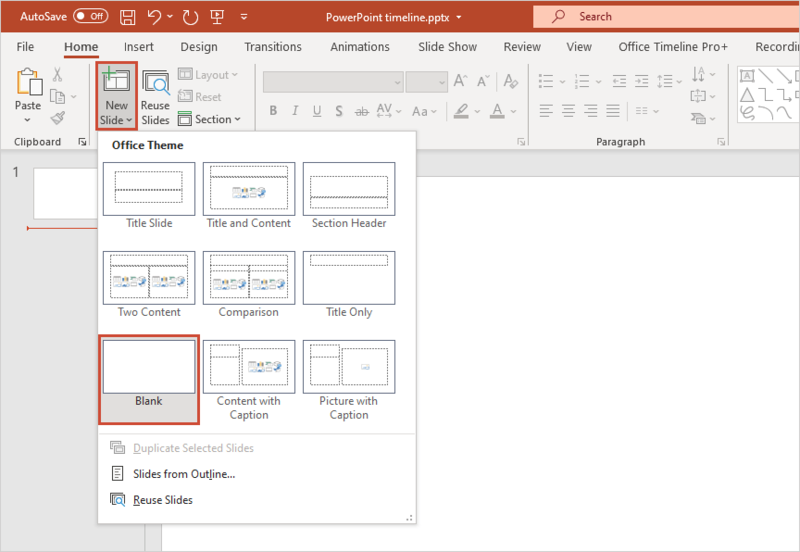 In the window that pops up, select the Process category, where you will find a variety of graphic options to choose from for your PowerPoint timeline. 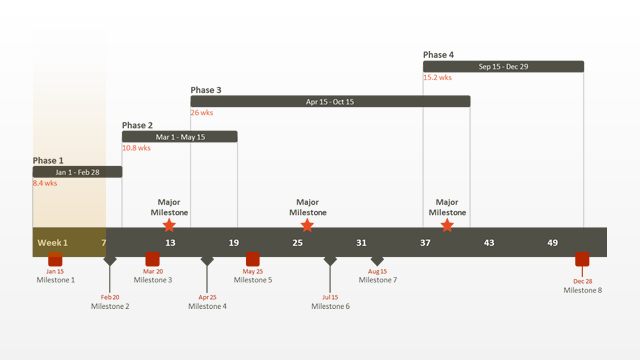 For a simple graphic that clearly shows the key events or milestones of a project, I’d recommend choosing the Basic Timeline. You can change the style at any time from the SmartArt Tools Design tab on the ribbon if you want to try out different layouts for your graphic. If the Text Pane is not already visible, click on the small icon right on the left of your timeline arrow to open it. 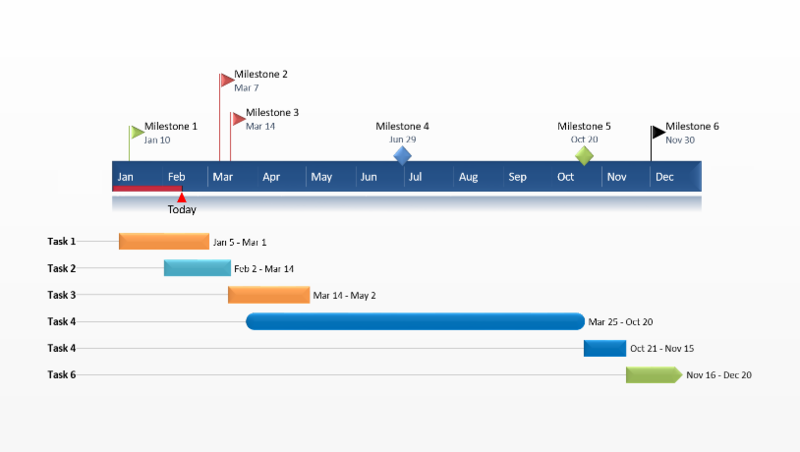 Here, type in your milestone dates and descriptions, and PowerPoint will automatically update the graphic. Press Shift + Enter to insert a line break and show the date and description of a milestone one below the other. 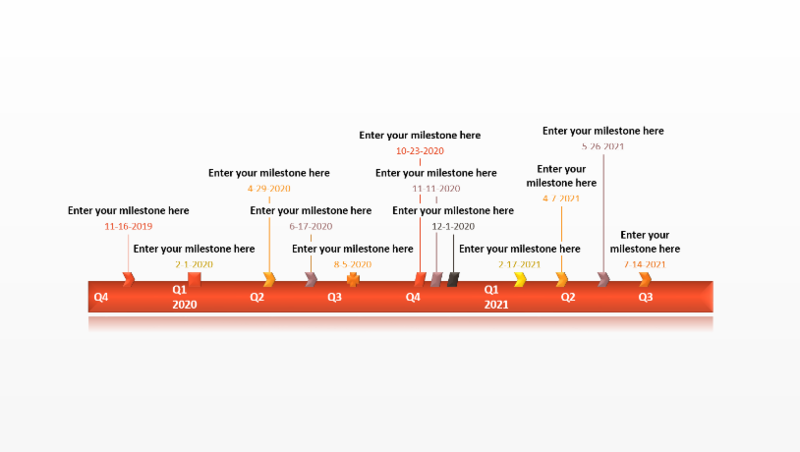 Note: As you will notice, PowerPoint places your milestones equidistant on the timeline, regardless of the relative distance between their dates. 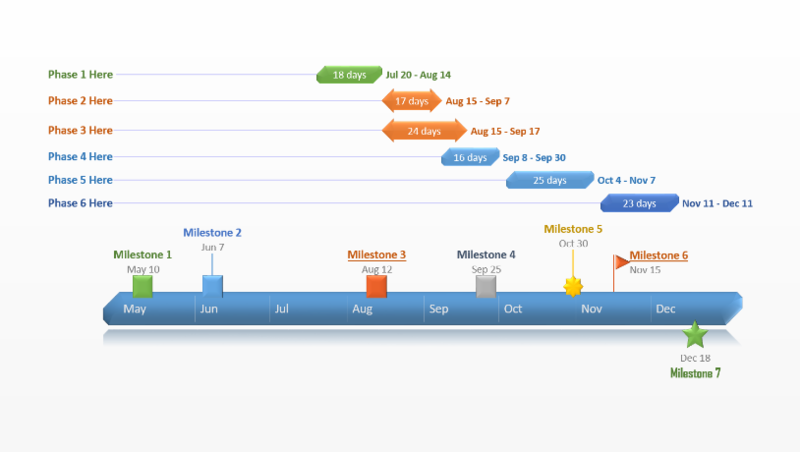 This is because the tool “reads” the information you enter as simple text, so it isn’t able to automatically calculate the number of days between two milestones. 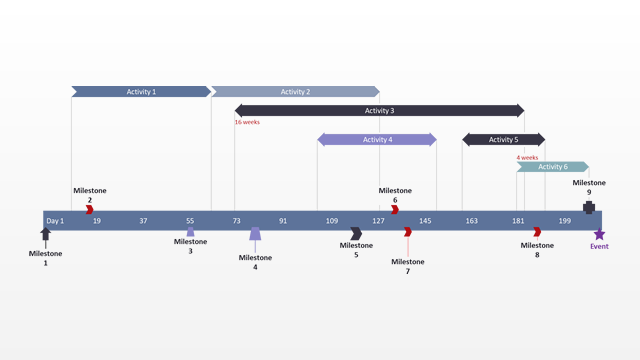 You can manually drag your milestone shapes and descriptions closer to or farther from each other, but as you add more items on the timeline, the layout will get distorted, so I’d recommend leaving them as they are. 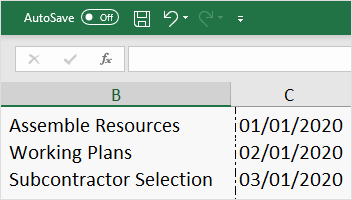 To add more milestones, simply press Enter after an existing item in the Text Pane and insert your data. You’ll notice that PowerPoint automatically shrinks the texts’ size the more events you add to your timeline. 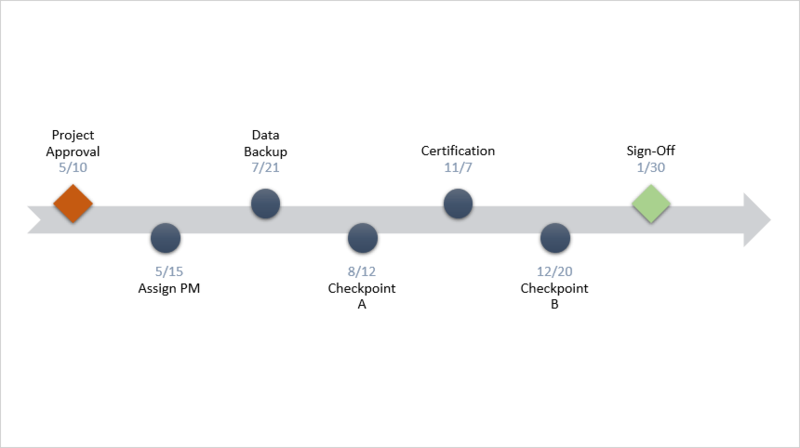 To ensure your data remains easy to read, it would be safe to keep to maximum 5 or 7 milestones. You may be tempted to manually increase the texts’ sizes for improved legibility. I’d suggest avoiding that because it tends to ruin the whole layout. Instead, you can expand the size of the graphic box as I did above, and PowerPoint will automatically make the milestone descriptions larger too. 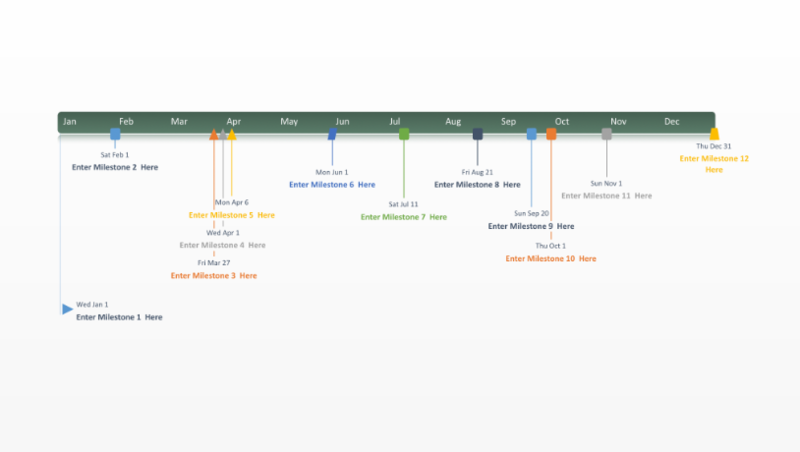 Now you can apply some styling choices if you want to make your PowerPoint timeline look more unique. 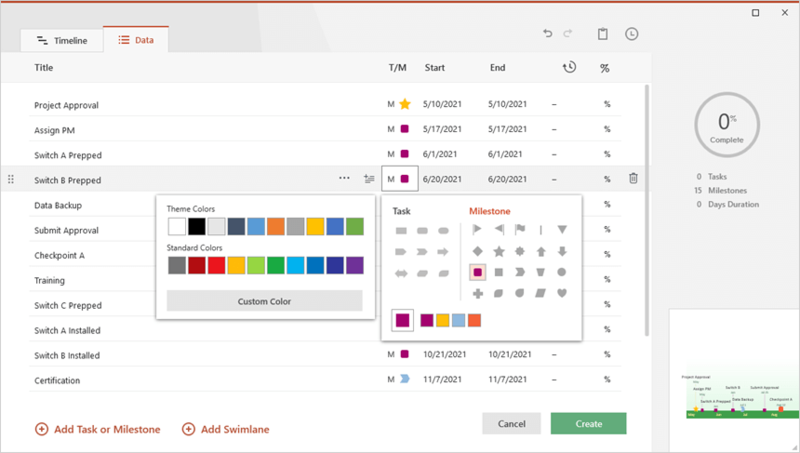 To customize the overall look of your timeline, you can change the SmartArt Styles and color palettes from the SmartArt Tools Design tab on the ribbon. In my example, I chose a darker color scheme from the Change Colors dropdown and selected the Intense Effect option from the Styles menu to make the milestone circles stand out a bit better. 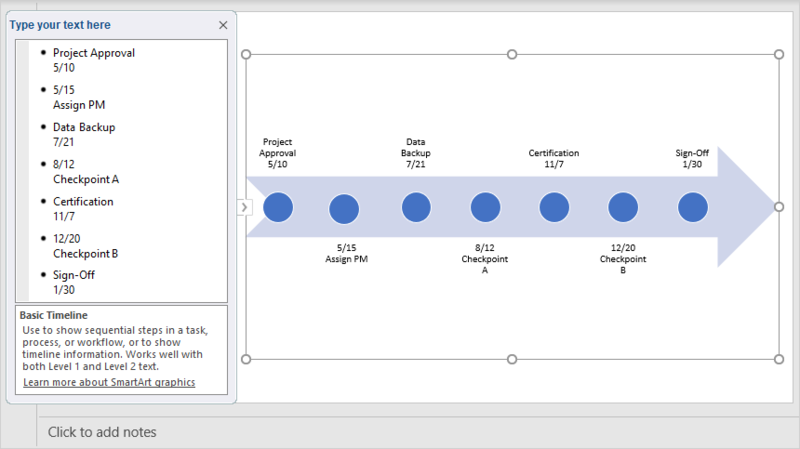 While the SmartArt functions apply to the whole graphic, you can also customize individual items on the timeline. To do this quickly, right-click on any item and use the formatting options that pop up to restyle it. 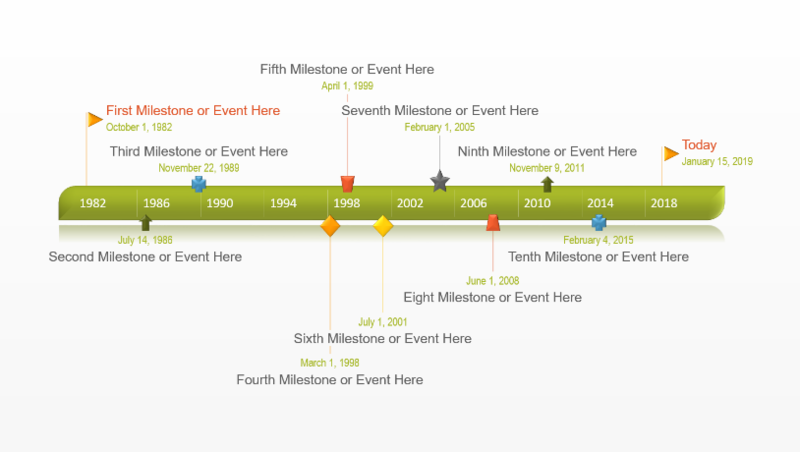 For instance, you can use Shape Fill to make specific milestones stand out or change the dates’ Font Color to differentiate them better from the milestone descriptions. Now, to make the milestones easier to follow, you can slightly narrow the arrow shape and move the circles closer to their corresponding descriptions using drag & drop. It may take a while to find the ideal positioning, but it will help guide your audience’s eye. Finally, you can also play with the milestones’ sizes and shapes to get a more unique visual or draw attention to key data. To do so, select the objects you wish to customize and, using the options in SmartArt Tools Format tab, you can resize them quickly or switch to other shapes. 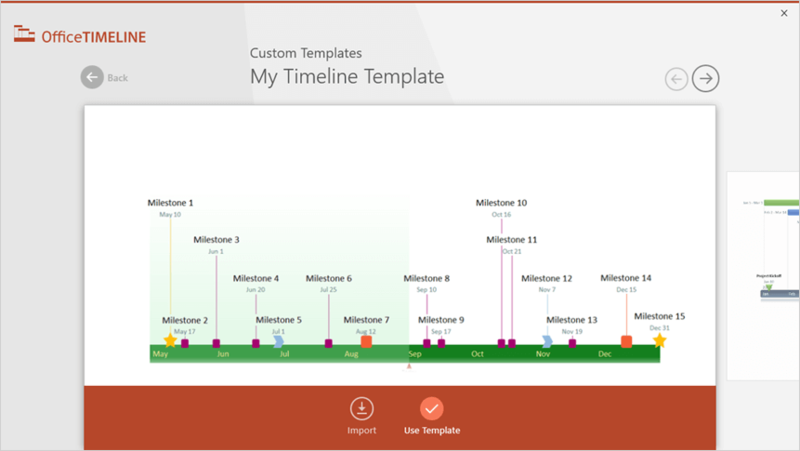 Manually creating and managing a timeline in PowerPoint not only is time-consuming, but can also get quite frustrating if you want to make custom changes or updates to the visual. 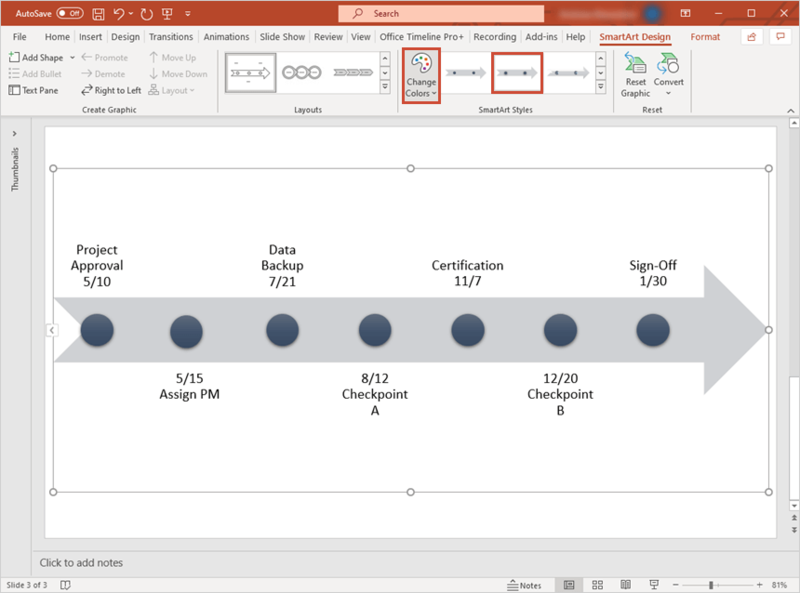 In the steps below, I will show you how to quickly build, customize and update your graphic using Office Timeline, a lightweight PowerPoint add-in that automates timeline creation and management. 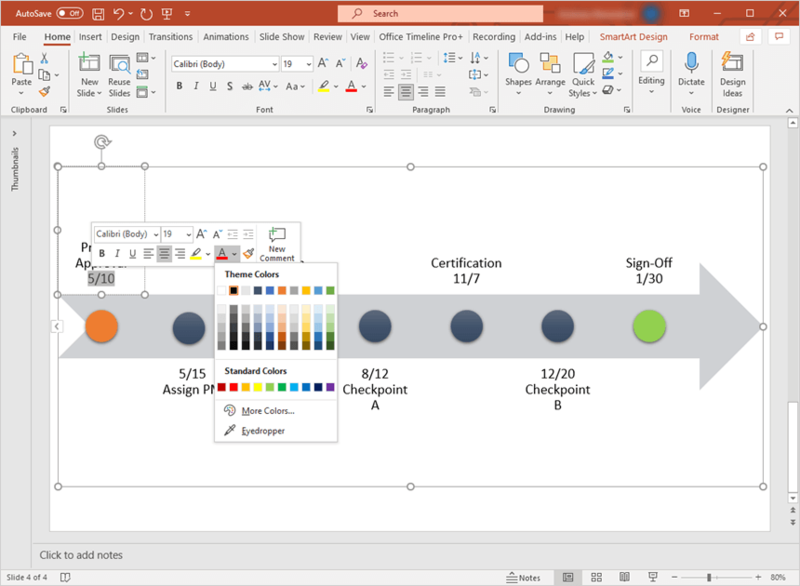 To begin, you will need to install Office Timeline Plus, which will add a new tab to the PowerPoint ribbon. 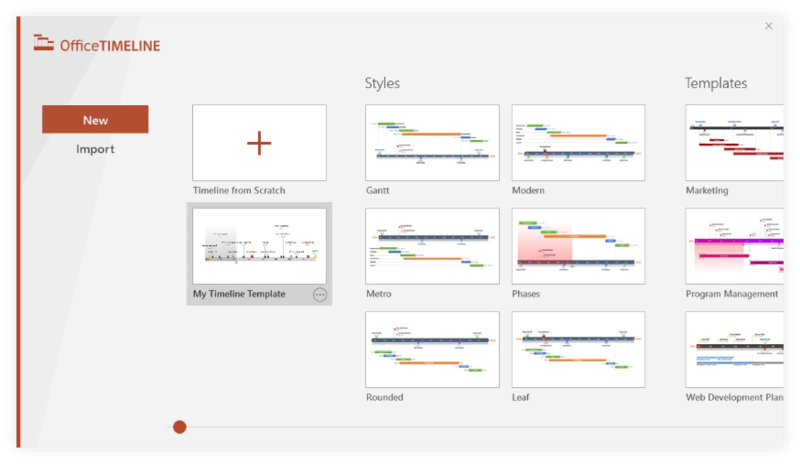 Inside PowerPoint, go to the Office Timeline Plus tab, and then click on the New icon. This will open a gallery that provides a variety of styles and templates you can choose from for your timeline. To select your preferred template or style from the gallery, double-click it and then click Use Template in the preview window to open the Data Entry Wizard. 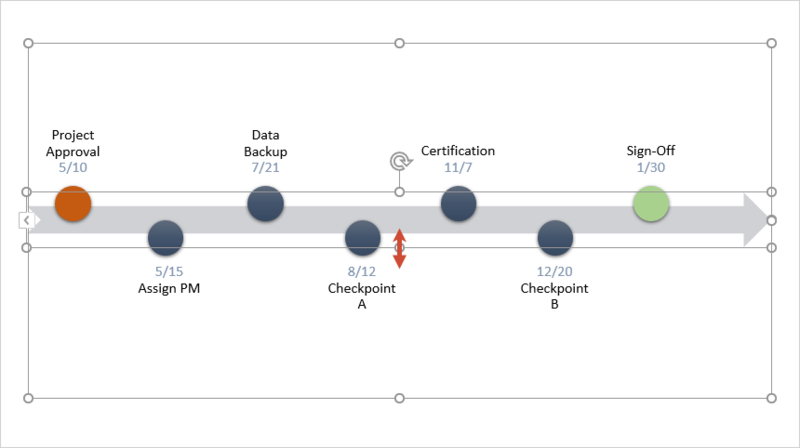 In this example, I will be using a custom timeline template I made earlier, which is available for download here. 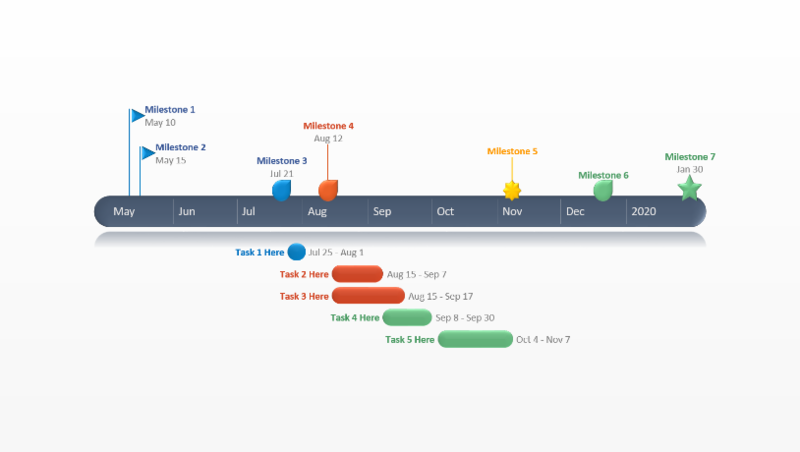 Now enter your milestones and set their dates, or copy & paste an existing schedule from Excel to save time. You can also make a few quick styling choices here, such as changing the color or shape of each item. Once ready, click the green Create button.